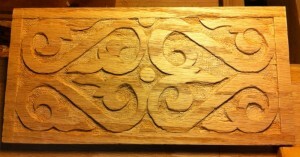 Here is my first S scroll panel completed for the box I am working on. The second half of the Scrolls went alternatively better and worse. Better because I had more awareness of what I doing, and it went more easily. Worse in the sense that the wood is pretty crappy and it crumbled in a couple of spots resulting in my having to change my design dramatically in a couple places. From a distance it looks ok, but it’s got some rough edges that should be crisp, and the design varies quite a bit in places. But over all I’m pleased with it as a learning exercise. It has served it’s purpose on that front well enough, and will make a decent enough box in the end. It will probably end up holding tools or some such in the shop. 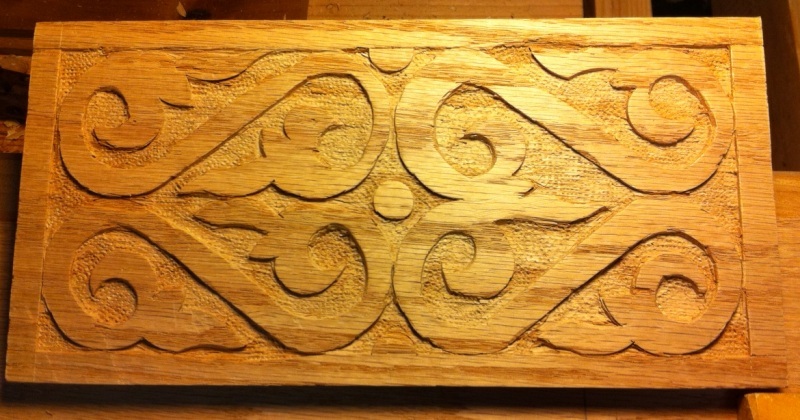 Now on to the next side, and deciding what pattern to use for the sides. Practice makes perfect, or in this case helps me learn the physical motions necessary, as well as how the wood behaves, grain direction and all kinds of things you can’t learn entirely from reading a book.